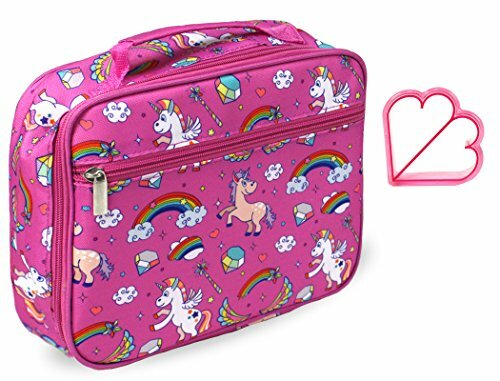 This insulated pink unicorn print lunch box is both adorable and functional as well as free of harmful chemicals. Safe for your kids! All of Keeli Kid's products have been thoroughly tested for lead and phthalates and are PVC and BPA free. Large enough for a bento box and water bottle and made from indestructible 600D Polyester, these children's lunch bags are durable, sturdy and very easy to clean. Kelli Kid's high quality children's lunch boxes include outside zippered pocket, a mesh pocket inside as well as inner tabs to secure utensils, water bottles and ice packs. As a thank you for your patronage, every Keeli Kid's lunch box includes an adorable MATCHING SANDWICH CUTTER! Each lunch container is 10 x 8.25 x 3.4 inches and comes with a no questions asked lifetime warranty. CARE INSTRUCTIONS: These can be hand washed in the kitchen sink daily and still stand strong. 100% Safe! BPA Free, PVC Free, Phthalate Free and Lead Free. All of Keeli Kid's products are thoroughly tested in CPSIA approved labs. If you have any questions about this product by Keeli Kids, contact us by completing and submitting the form below. If you are looking for a specif part number, please include it with your message.